I'm sure you already knew I am a bit of a candle addict. I love discovering new candles and scents and I like to burn them everyday. I had tried many different candle brands, but I have never had a Yankee Candle which is probably the most famous brand for the scented candles. Therefore when an opportunity came, it was time to get my hands on the 'America's best loved candle'. 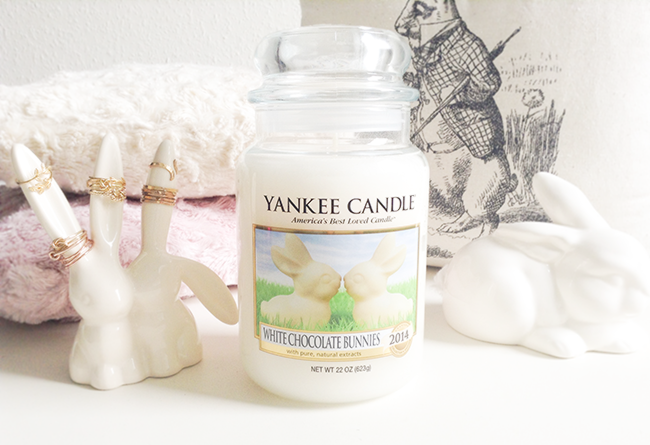 For the first time I picked a new scent called White Chocolate Bunnies which is collector's edition scent for Easter. I love love love white chocolate and this candle smells exactly like it. Once lit, scent spread through the room within a few minutes. I can not tell you how delicious it smells, it's really sweet but not sickly or overwhelming. It's such a happy scent! I got the candle from the Scented Candle Shop - they have a great selection of all kinds of candles and other related items, it's a treasure site for a candle lover like me! I also got a few other goodies which I will show next time. Sounds amazing! Love the way you shot this! So adorable! OMG I want one too. I love candles too. This scent sounds amazing! 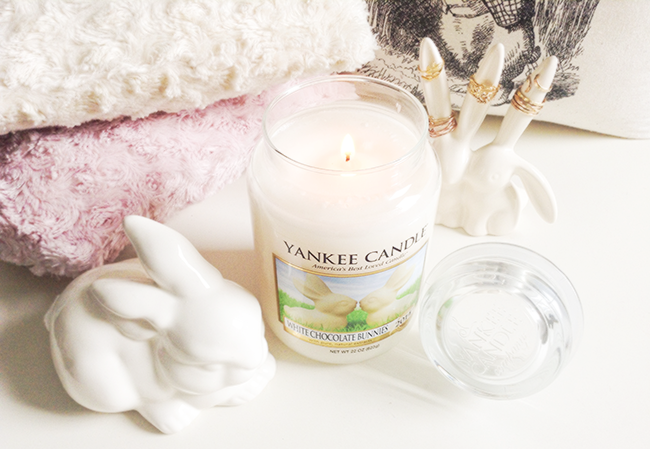 This candle and the rabbit are so cute ! Aww, as if the candle wasn't sweet enough, your photographs make me want to buy it even more! 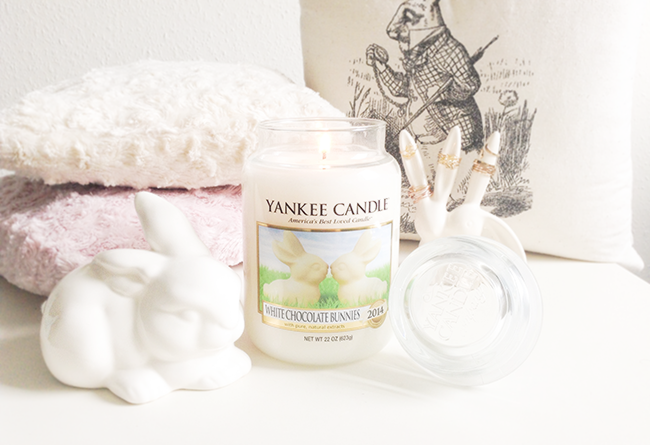 Love your bunny ring holder! So cute! Wow, this sounds amazing. I'm not really a candle person but I really want this scent. This might just persuade me to purchase a Yankee candle! Soo glad you posted this! I had seen this and was going to buy it and i think you have swayed it for me! Have a lovely weekend! I love Yankee, I'm currently burning Pink Sands. I love the sound of this one definitely going to have a quick smell when I'm next out shopping! I so want to smell this candle. I'm going to go on a hunt to find it. Oh, sounds so good.. I love white chocolate! I've not heard of this scent before! It sounds lovely and that's great that it's not sickly. Keep in touch via bloglovin! cute blog! can you follow me back? thanks! kisses! Great photos, love the light. I smelt this today and it was so sweet, but I don't tend to burn many candles in the summer so I might buy it and keep it till next Autumn.